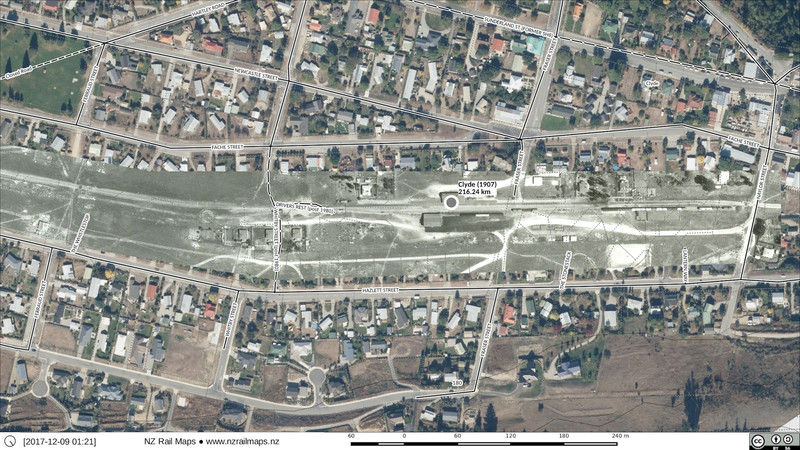 This is what three historic aerial photos covering the area from Water of Leith to Andersons Bay Road look like. After a long complex process of sizing and rotating I have these all lined up ready for the masks to be done on the 2013 Linz aerial imagery. 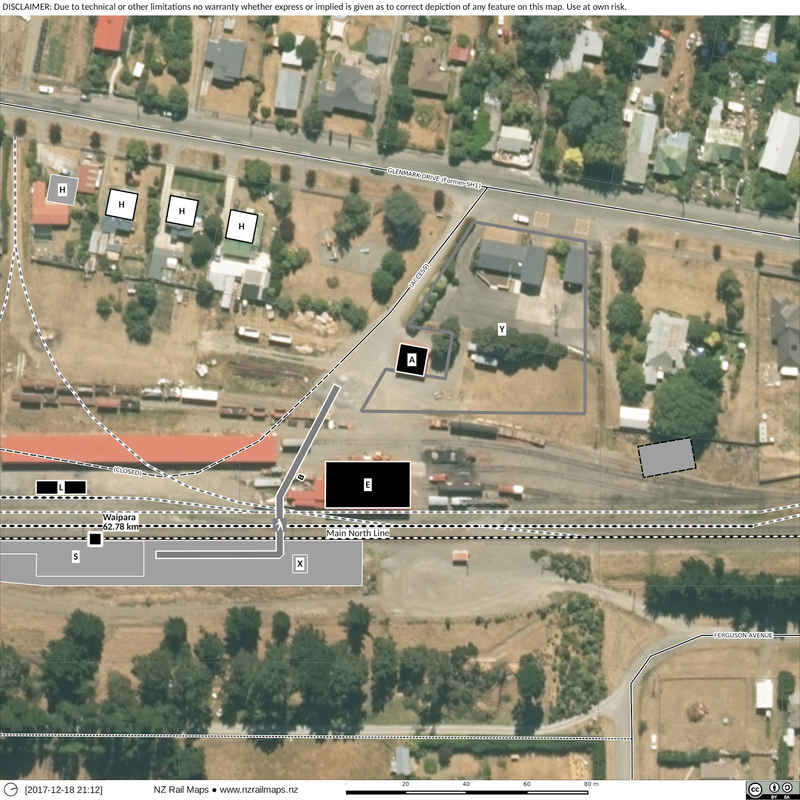 The masking is complex because rail tracks used to cover a lot of area in this part of Dunedin, as they went around various industrial areas and across wharves. 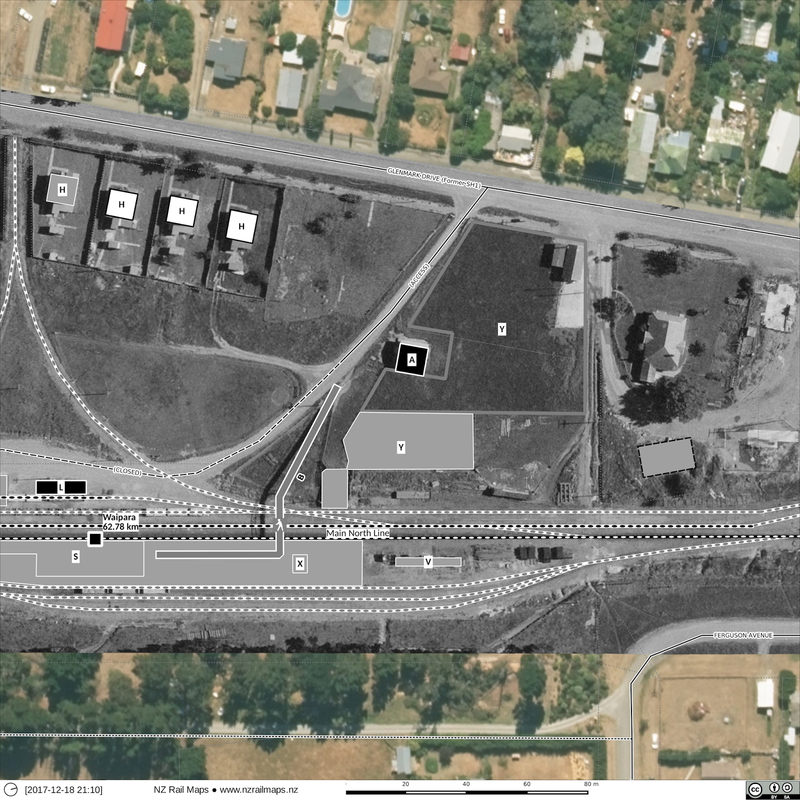 I am trying to mask out as little as possible of the current day imagery which means a lot of work selecting just the areas that have rail tracks in them, and so far I have only done a little. At the same time it looks like I am possibly converting all my Qgis projects back to version 2.18 as I have all but decided to ditch the development masters. At this stage I am not sure what work is needed, but the project files for 2.99 are only partly readable in 2.18 so some areas of layer styling are going to have to be hand ported per project. I have just finished setting up the testpc with Debian 9.3 and Qgis 2.99 and put 2.18 on mainpc to start the work of backporting projects with. Just another quick update to the earlier article. 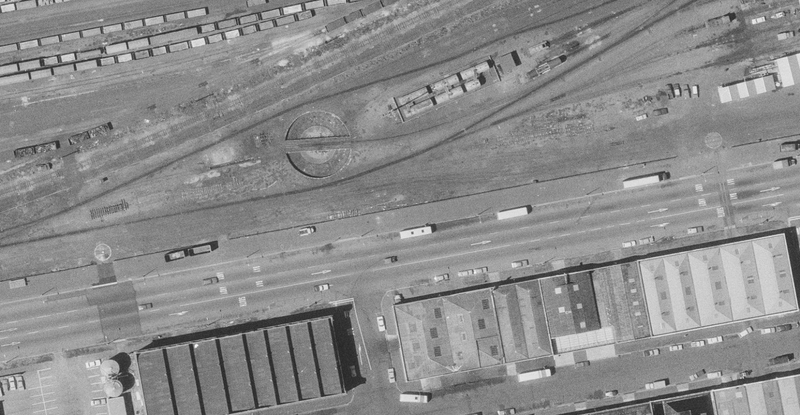 In 1978, Dunedin Loco's turntable was opposite the intersection of Cumberland Street and Wolseley Street. Along the edge of Cumberland Street can be seen a pair of wagon turntables. These were a quick and easy way of getting a siding into a premises that was right next to the railway line, however the premises had to have their own way of moving the wagons between the turntable and their building as regular shunting locomotives could not traverse the small turntables. 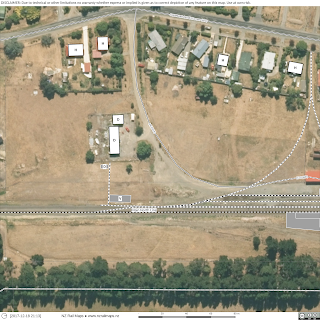 Particularly with the right hand example, you can see the track at right angles crossing the main road - which was possibly disused by that date, and the track in the left hand case has been removed or buried. 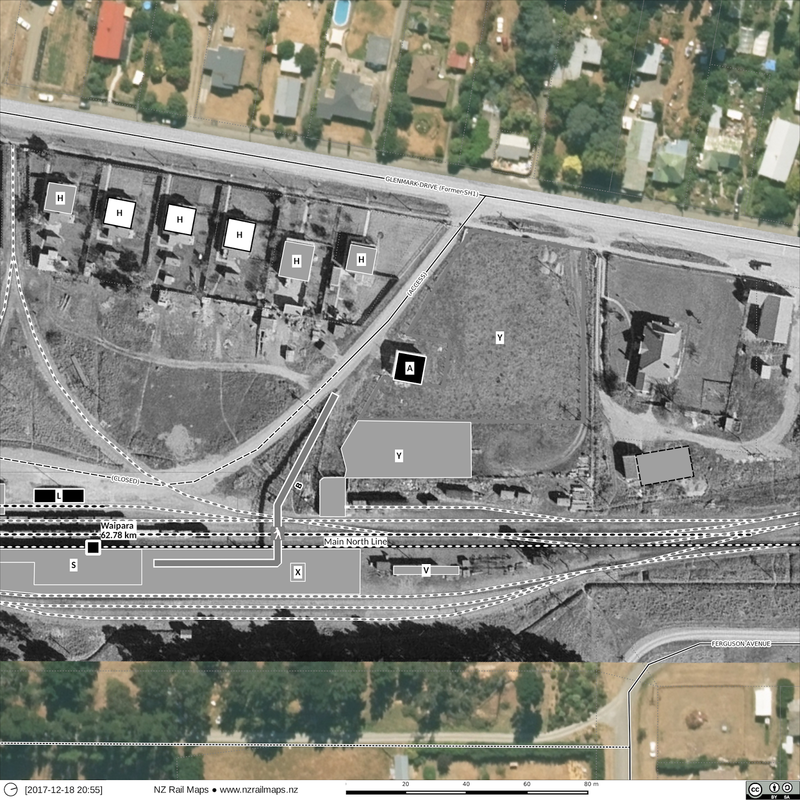 The series of buildings on the right hand side of Wolseley Street still exist to this day - the left hand building is now a Z service station, while the loco turntable site is a BP service station. This information was gained from something like 100 different files. In essence this enables the maps to be substantially completed with diagrams of almost every location for which aerial photos are not available so as to make the maps the most complete that they practicably can be. It was not possible to locate the Reefs stations readily in file titles so they are among the few missing. Work will continue to complete the maps in accordance with the publication timetable of Parts 2 and 3 of the article series which is going to be happening for about another 3 months or so. A file in Archives Dunedin dated 1913 refers to a bridge built at 18 3/4 miles which had 8 spans each 13 feet long, a total of 35 yards length. As no other information to corroborate the existence of this bridge has yet been found, it must be marked as hypothetical. It would have been as shown between Bridge 13 and Tunnel 7, between Machine Creek and Deep Stream. One possibility is this bridge could have been replaced with a culvert, however there is no such structure recorded at this location in the chainage charts. 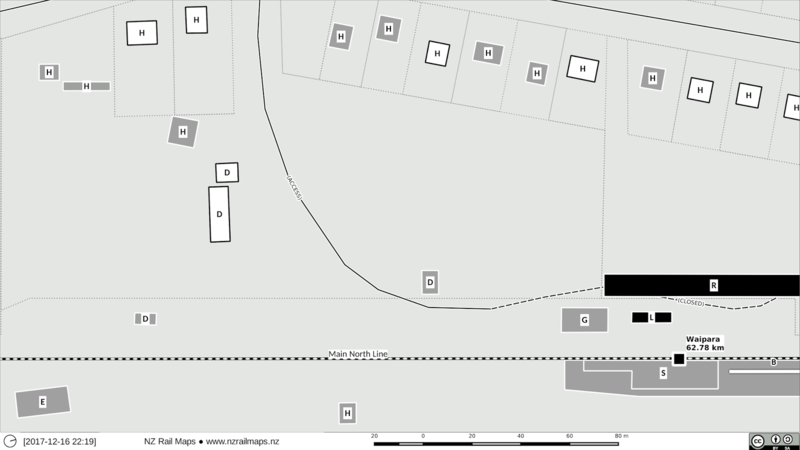 Another possibility is that like Bridge 13A referred to in a recent post on this blog, it was a temporary structure later removed (although the file suggested it was to be made permanent). Bridge 13A was built to cover a slip and this could also have been the situation with this location. 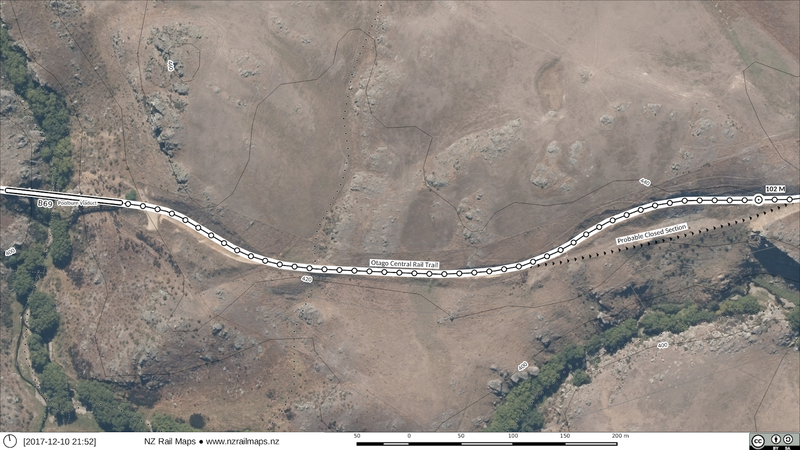 A close examination would confirm details such as whether a retaining wall exists in this location to enable the void in the embankment to be filled in. I don't have the ability to accomplish this obviously, so the bridge will remain on the map marked as shown above. 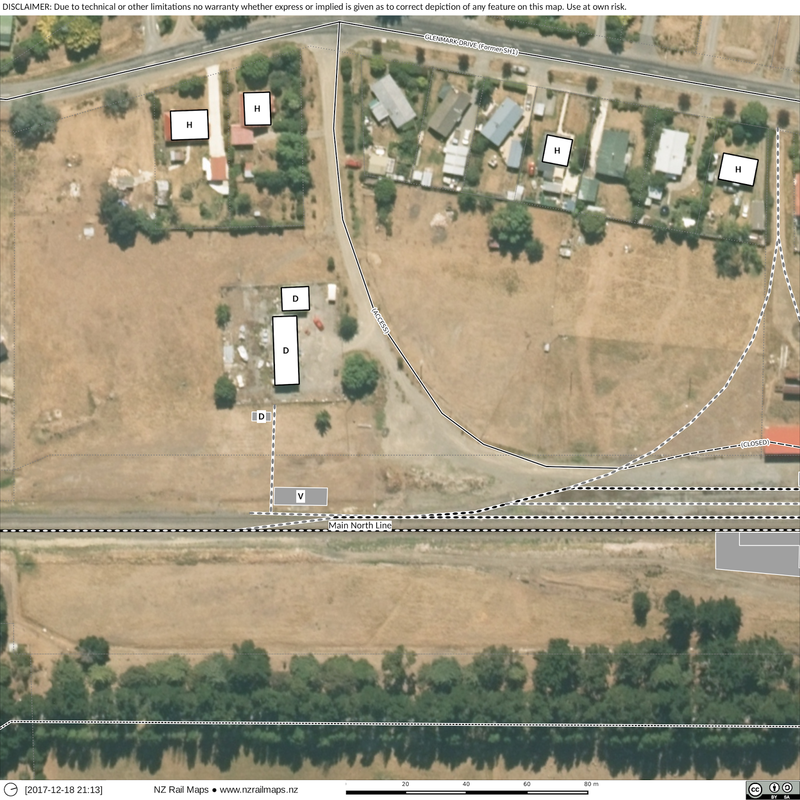 In 1911 NZR signed a lease agreement with the Taieri County Council for the construction of a stock walk on the east side of Bridge 9 (Taieri River) and the erection of overhead stockbridge Bridge 9A at 75 yards north of Bridge 9 as shown in the left of this map. In 1964 the lease ended and was replaced by a level crossing right established across the Hindon Railway Station yard as seen to the right of this picture. The footway and overhead bridge were removed subsequently. 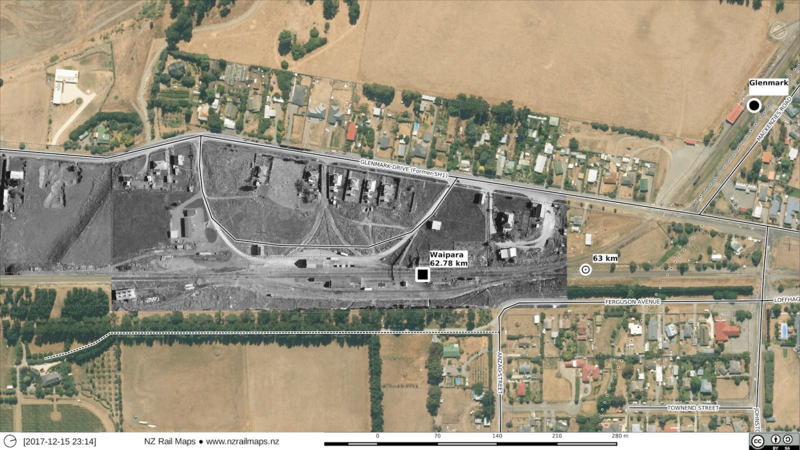 The need for these structures ceased at the time because a new road bridge was built over the Taieri River as seen in the middle of this map. 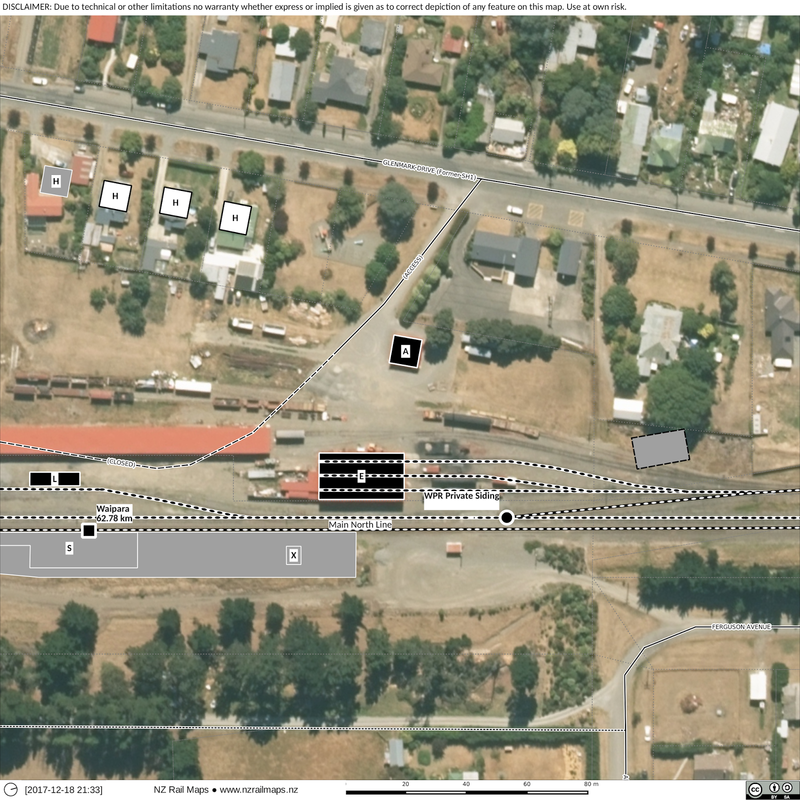 Sometime in the mid 1990s the road bridge was undermined in a flood and the Dunedin City Council which has a majority shareholding in the Taieri Gorge Railway and is also the current local authority for the Hindon area, decided the best outcome would be to convert Bridge 9 to a combined structure with a single shared deck for both road and rail traffic. The old road bridge was removed after new connecting roads were built to either end of Bridge 9 and the road across Hindon railway yard was closed. 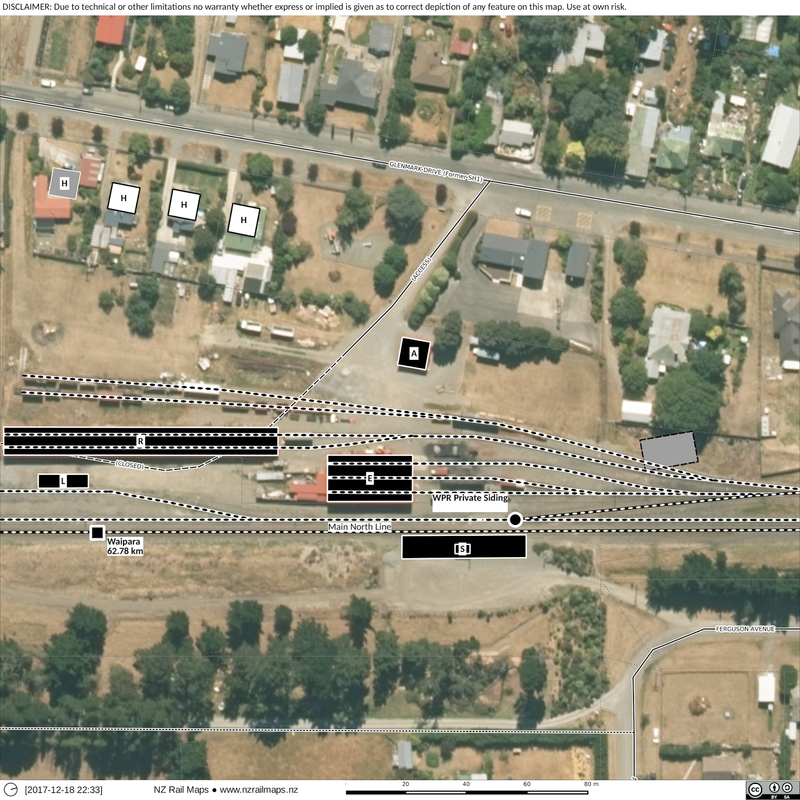 The improved road access to Hindon in the 1960s was instrumental in closure of the siding at Christmas Creek on the south side of Bridge 9. 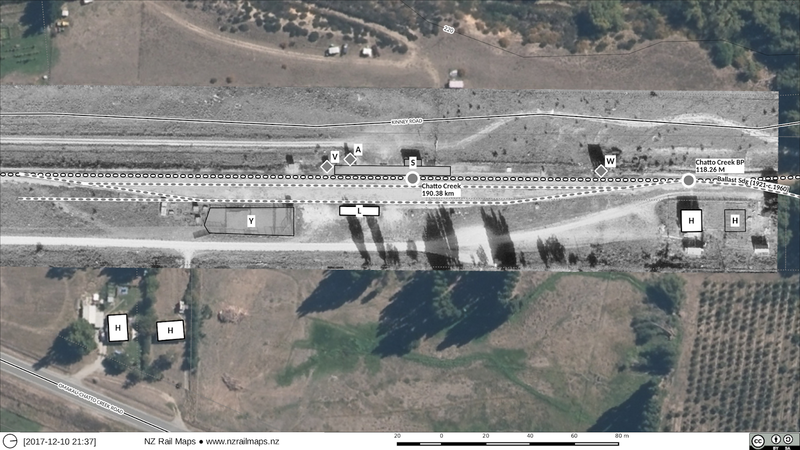 Many small stations in the Taieri Gorge were largely maintained as the railway provided the only form of transport until comparitively recent times and it is somewhat surprising Bridge 9 was not made a combined structure from the outset. On the other hand, the TCC would have had to pay NZR considerably more maintaining the deck of a combined bridge than the 15 pounds they paid annually for the stock walk and overhead bridge. Hence it may well have been decided that this was a more economical solution but this is pure speculation on my part. Little Mt Allan is another example, only one or two farmers used it, which was not enough traffic to have a siding put in, but with no other access to the area, wagons were loaded or unloaded by trains stopping on the main line by special arrangement. 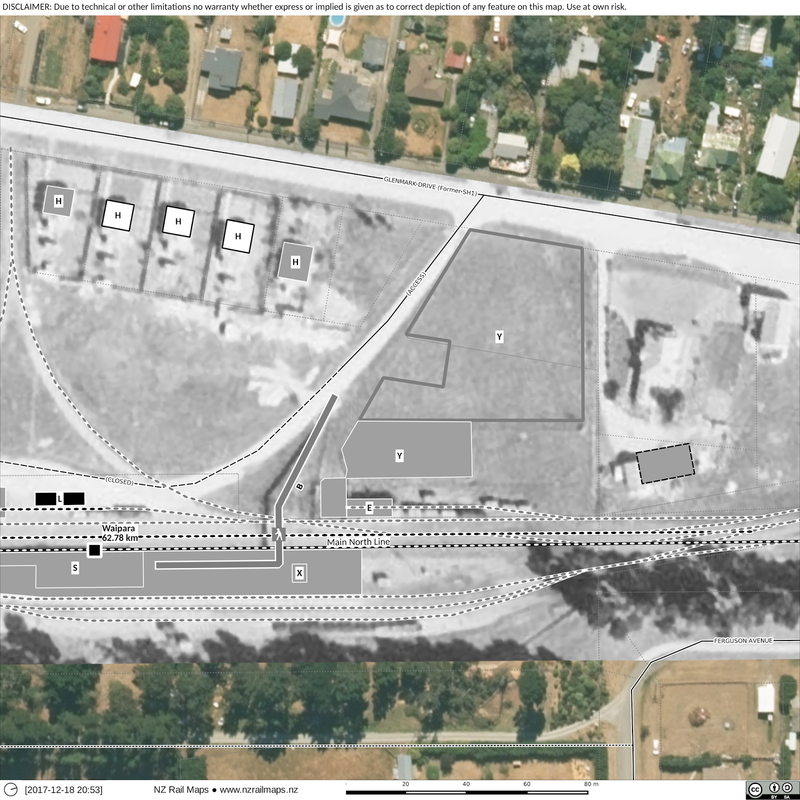 Taioma is another example, the access issues here were solved by moving the station closer to Wingatui where it was more accessible for the sole farmer of the area, Mr G Webb. 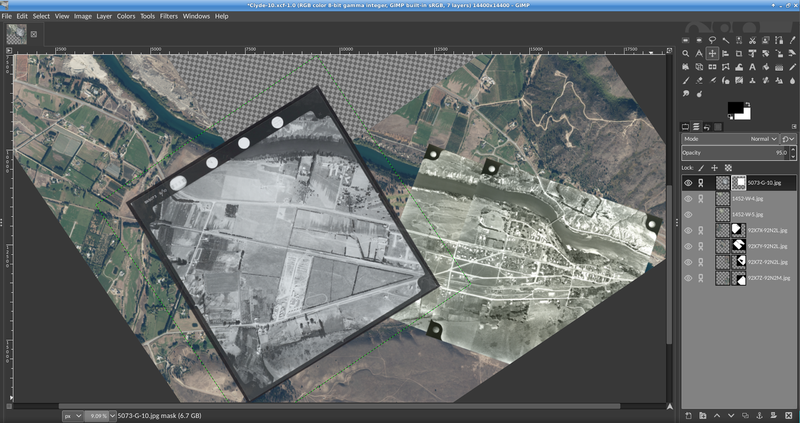 Well the OCR maps are humming along nicely but naturally I am looking forward to wrapping up that part of the project. Right now I am working on tidying up a lot of loose ends as I get ready to write Part 3 of the article series. Three weeks ago I wrote about some areas that have limited aerial coverage. The best way of fixing that is to get station plans, and at the moment I am working on that. Basically that will include Ida Valley, Auripo, Ranfurly, Waipiata, and probably some of Wingatui-Sutton. So that means all those maps can be drawn properly without the aerials. 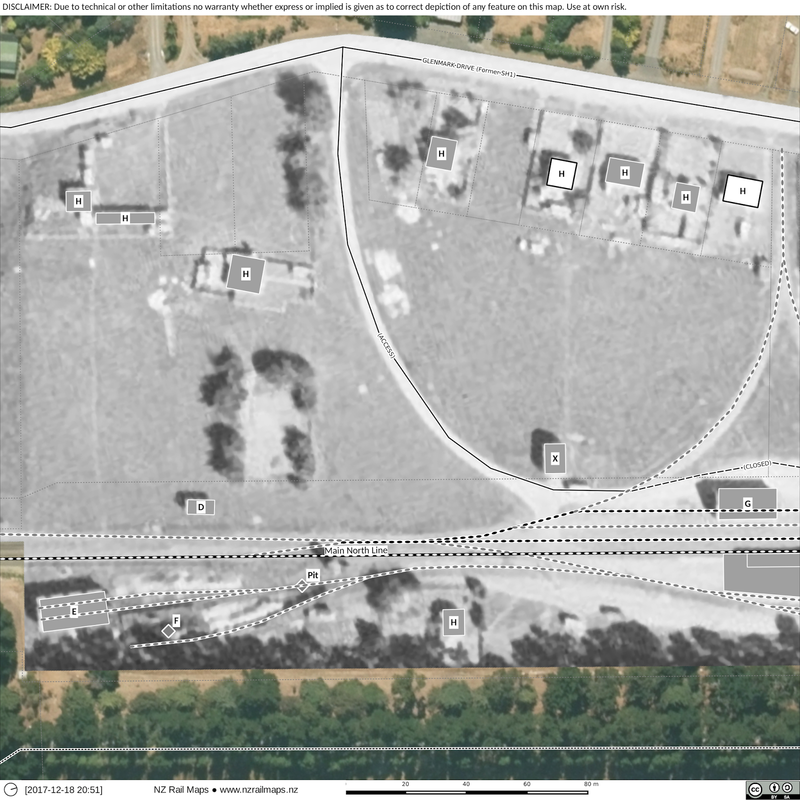 It just means you won't see a historical aerial for those areas, but you will still see a station diagram. 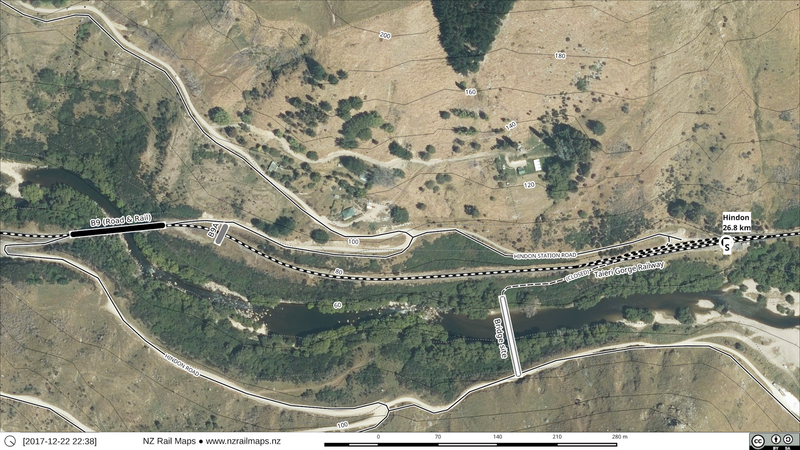 It would be nice to get some of the Taieri Gorge and I hope that will be possible. At the north end there have been some changes in track layout between the branch, branch platform sidings, main and loop. 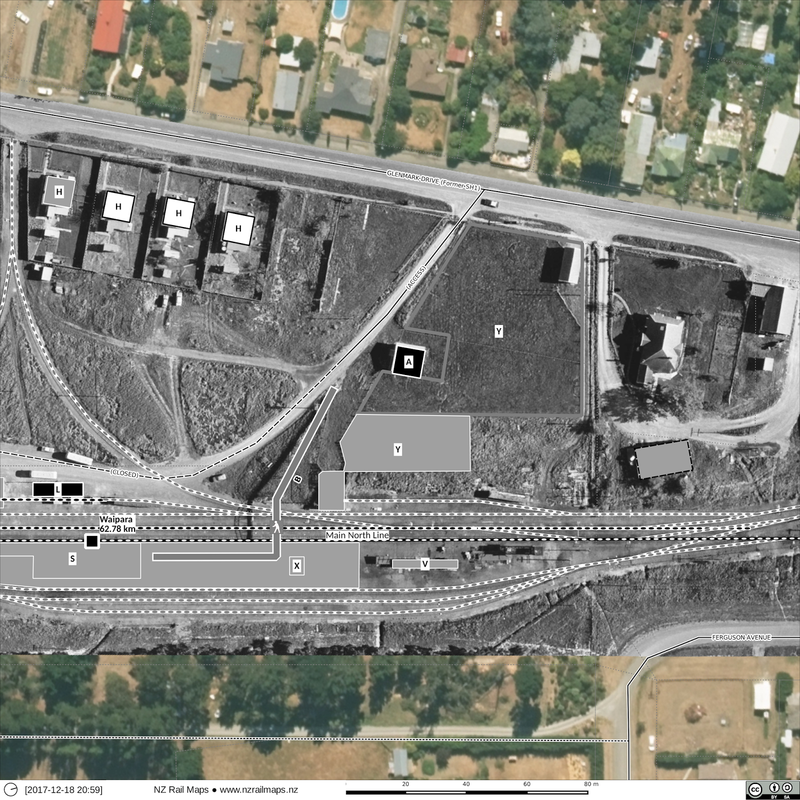 At the south end the main difference is the country works depot being built, the engine depot facilities have completely disappeared and the singleman's quarters ("the kennels") have gone. Since 1950 there are not many changes in the yard. Mainly in the number of houses, and the appearance of the social hall marked A at the north end. 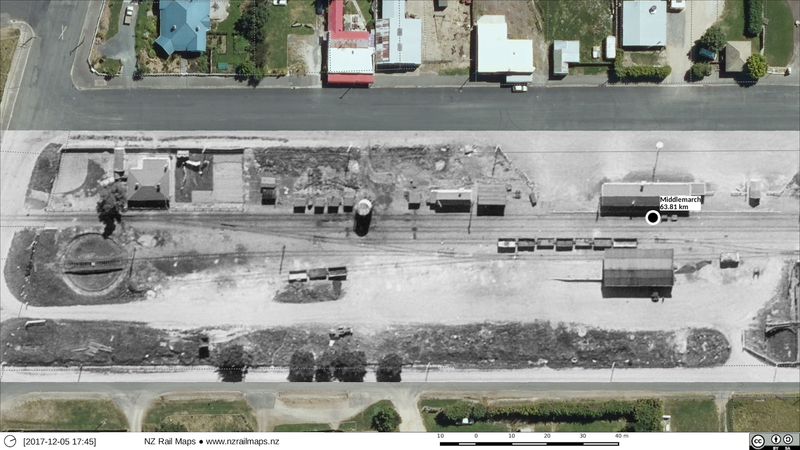 This is a very quick comparison shot of Waipara in 1950. See my previous post for more detail of what the buildings are. 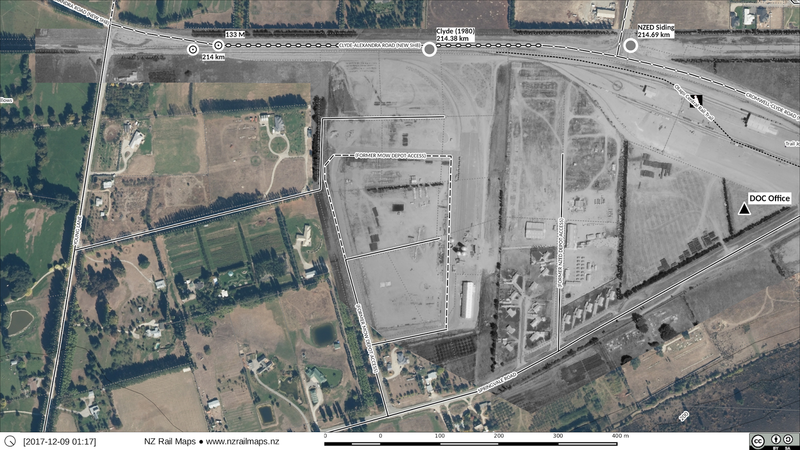 Once again this article is not in either a MNL or Waiau Branch series, because these pictures are another set of samples rather than a complete set of maps for Waipara. 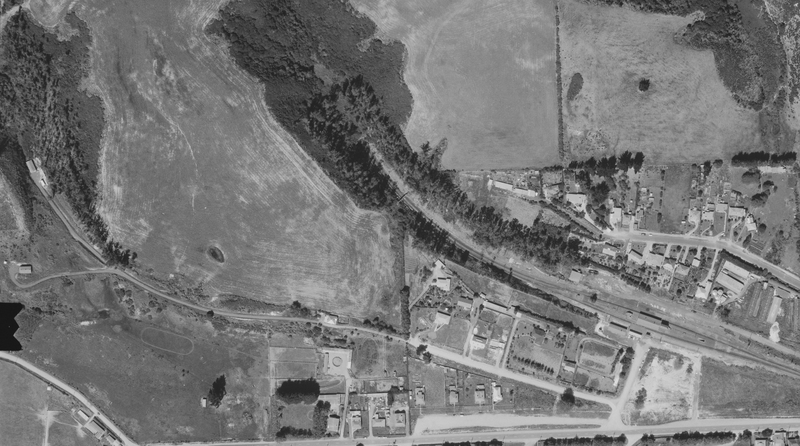 I am warming to the idea of doing a Waiau Branch series, and also adding the 1950 aerial of Waipara to the 1961, 1972 and 1979 ones I already have, for a specific set of maps for that date. There was an aerial series produced in 1934 which I can't find any trace of, and there are probably also later ones but I haven't yet attempted to find any details of such, so at the moment there is a big gap from 1979 until 2015 or 2016 when the current aerials were produced. 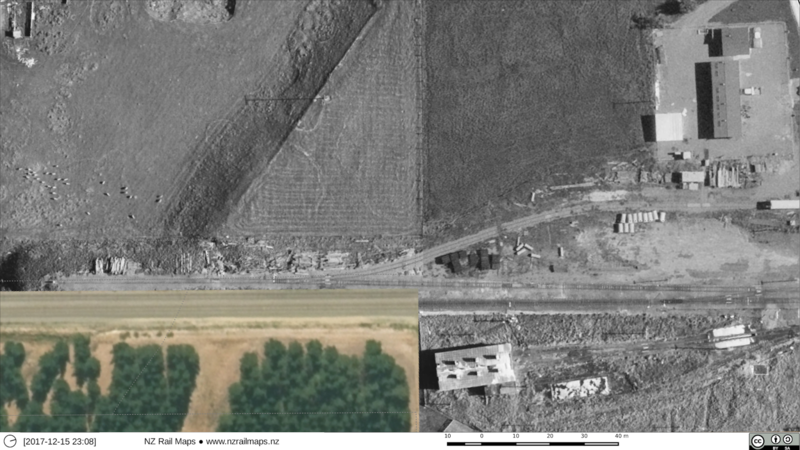 These aerials and maps just show buildings and structures rather than tracks, and all buildings/structures over the whole site rather than generations, so hence it is not a full set of maps. The aerial photography is the current colour stuff from Linz. Grey - a former railway building/structure (that doesn't exist any more). White with solid border - an existing building that may or may not have ever been a railway building in the past. Transparent with dashed border - a former building (gone) that was never a railway building. The letter codes are described below each map as they are used. The map key on the maps website is now out of date as one code has been added and the meaning of another code extended. 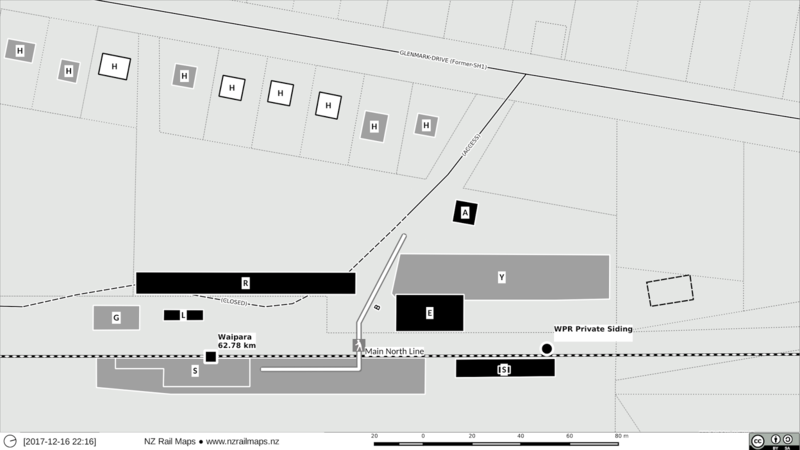 The number and position of the railway housing has been taken on the basis that Dew's map shows the railway houses. Starting with the south end of the yard. 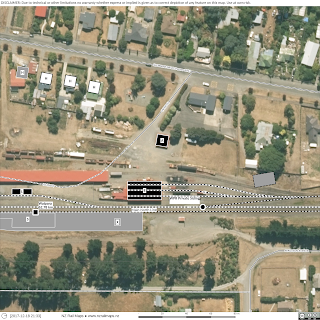 Mostly what was at this end are the NZR engine shed (E), way and works depot and other various sheds including the country works depot which still exists (D), the various houses (H) including at upper left "The Kennels" which was the singleman's accommodation and the stationmaster's house near the way and works depot, and as we head to lower right, the Weka Pass Railway rolling stock shelter (R), the original goods shed (G), loading bank (L) and the original platform and station building (S). Note there are not many of the original 16 or so houses still there today. Some have been long gone; others have disappeared more recently in private ownership. There is a bit of an overlap so I will just go into the middle. 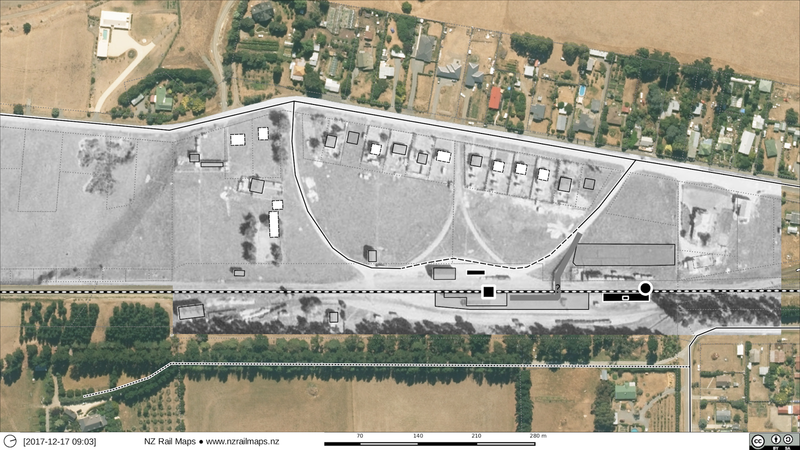 In upper centre labelled (A) is what used to be the Waipara staff social hall and is now the staffroom for the Weka Pass Railway. 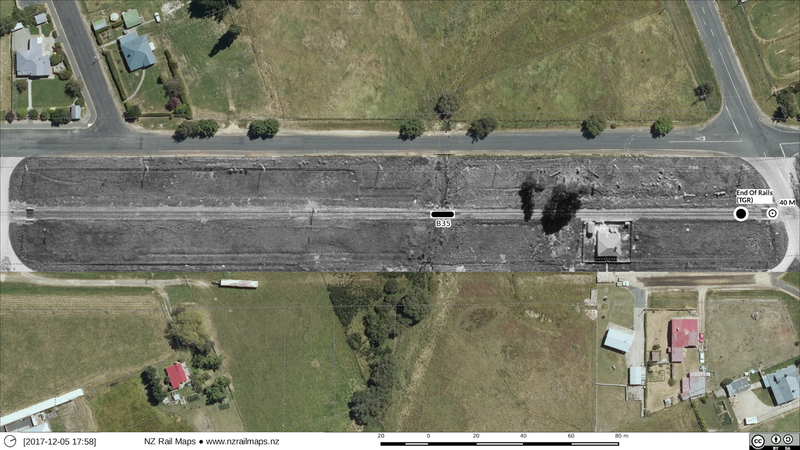 Directly below that is the former stockyards (Y), the Weka Pass Railway engine shed (E) and the old footbridge (B). Then there is also the present day KRL platform and the station building (S). To the right of the stockyards you can see where a privately owned building used to be, where some of the Weka Pass Railway's yard tracks go through. 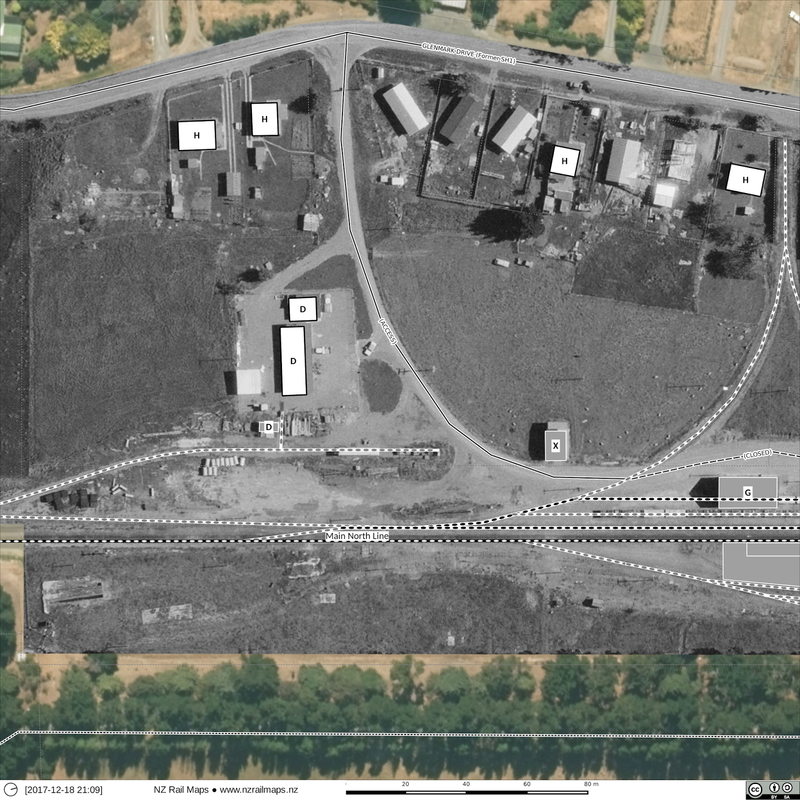 It's evident that a strip of land at the back of that property must have been sold to the WPR to enable them to put the extra tracks in for their rolling stock shed and the storage tracks next to it, as this land was never part of the railway yard. 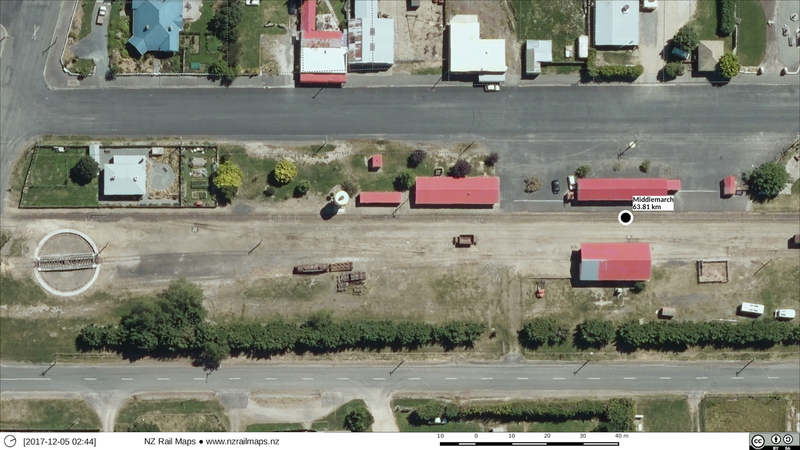 So there are our set of maps/aerials just for starters. When I get on to doing MNL stuff again next year some time after the Otago Central stuff is complete then I will do a full set of maps of 1950, 1961, 1972, 1979 and also try to find out what other generations I can find because something like 1995 or 2000 would be really good to have as well, and of course all the various tracks can get drawn in as well. 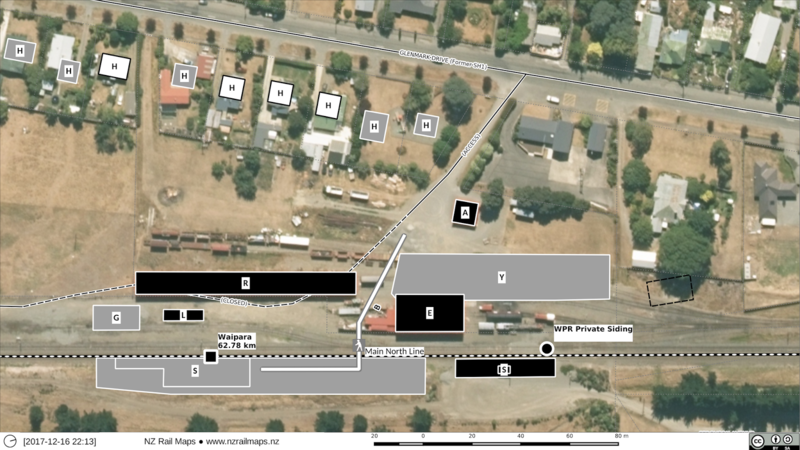 I have just kept them off for now because there is no point in having a track going through a building when the track and the building/structure are from different generations, and the purpose of these particular maps is to show all buildings or structures of all generations on one page, as just a quick introduction to the history of Waipara. Following on from the previous post about discussing where things can go after Otago Central I have been looking at aerial imagery available for North Canterbury (Waiau Branch and MNL) and Hawkes Bay / Eastland (NGL). At the same time I am also looking at Volume 12 completion (Kingston Branch and its various branches, but not quite as actively. With the reopening of the MNL (the highway officially reopens today) it is opportune to look at completing those maps and with the discussion about reopening part or all of the NGL (and also a friend has just moved to Napier) that is also timely. 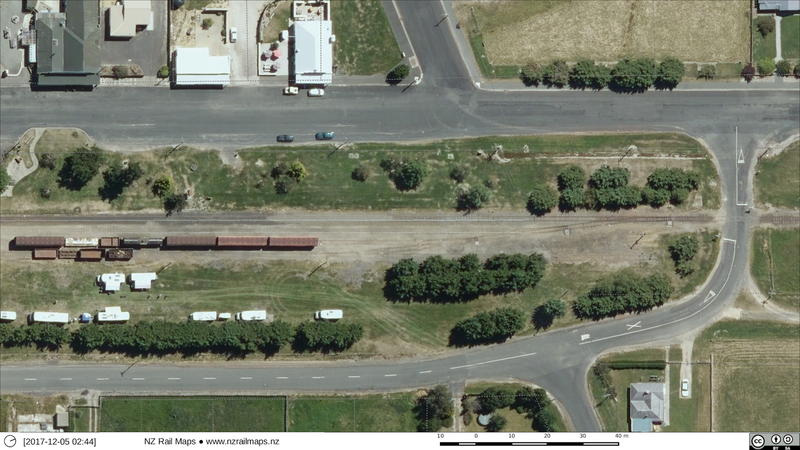 So I have obtained the aerial photography for the Waiau Branch route to add to the earthquake coverage of the MNL which I already have. The route of the branch is nicely covered by relatively recent 0.3 metre resolution imagery which is a nice sharp resolution, although somewhat washed out in appearance as it must have been taken on a very bright day. 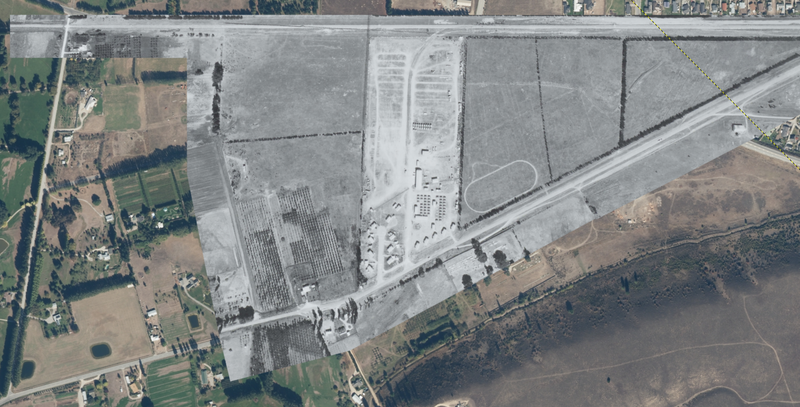 I have aerial images of Waipara from 1972 which will be put into this Gimp project when I have some time and then it will all be detailed in due course. And that is all the work needed for Volume 10. Should be easy, right? 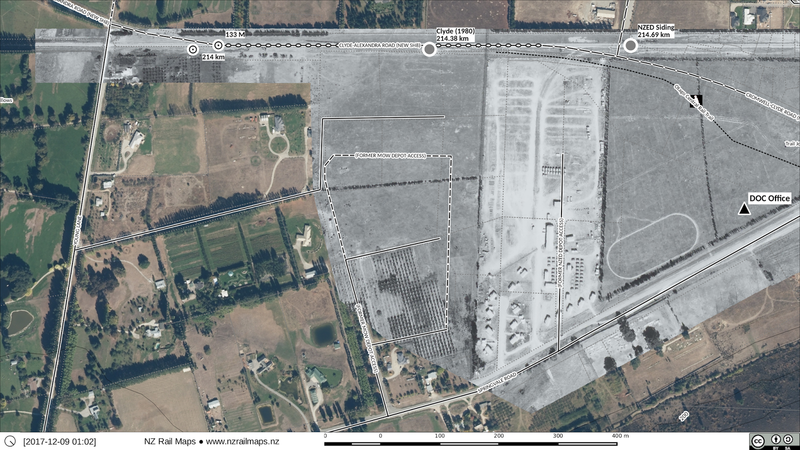 Except that a lot of the Addington-Rangiora stuff is a mess because of multiple times the Christchurch stuff has been changed (project and data formats/structures etc). I'm not going to give a timeframe or priority but let's say I expect to progress that in the first half of 2018. (Note the km pegs are not likely to be published in a volume or the official maps online as they are probably KRL copyright information and I can't be bothered at this stage contacting KRL to see what their views are.) This is an old project by present standards - last used nearly 18 months ago and still in EPSG 4326 so it has to be converted to EPSG 3857, since all the aerial imagery is in the latter CRS. 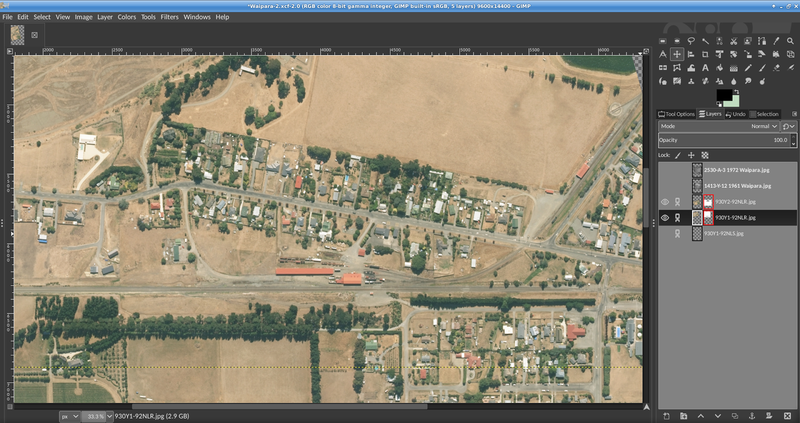 On the Gisborne side the available aerial imagery is 0.4m resolution dating from 2012-13. Still reasonable - some of the older Linz stuff is 0.7m for the Otago Central so it's quite good at 0.4m. As it happens there is 0.1m coverage of some urban areas, which is Muriwai and the Waiapaoa Bridge all the way into Gisborne. NGL may or may not have all stations detailed - I am not making a firm commitment even though I have good aerial coverage for practically all of them. 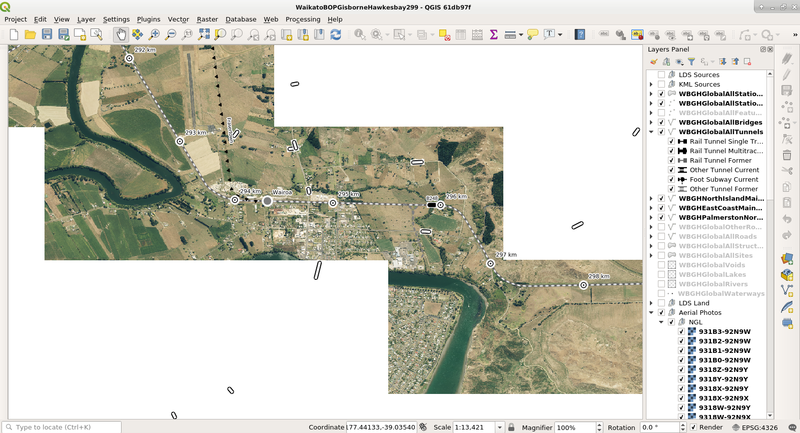 What I will make a commitment to is the historical coverage of Napier, Wairoa and Gisborne, plus the basemap stuff anywhere else along the way. Sometime in 2018 (no firm dates of course). After finishing the Otago Central Railway then the Kingston line and its branches but not at a full level of detailing. I will look at detailing any branch junctions and terminii and possibly Riverton but I won't absolutely commit to those as I haven't checked out the full level of available imagery and do know that for some of the areas good coverage isn't available. Volume 12 will be finished probably in 2018 but I haven't decided the priority. It is highly possible it could just be rushed out as is (without any more work on Kingston Branch stuff than what I already have) and adding any more detail is just left for sometime further down the track. So there is some kind of development roadmap going forward. The priorities are largely geared around communities of interest. 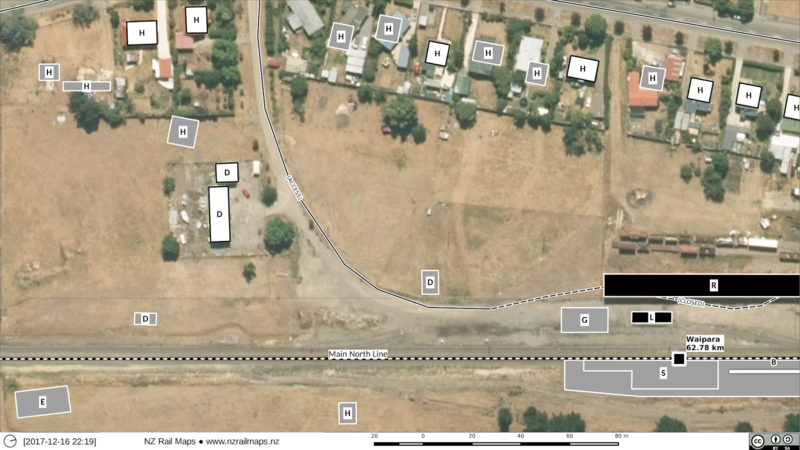 The Waiau Branch has a significant community of interest with which I have historically strong connections although going back roughly 25 years since I had any significant involvement. I don't expect the same community of interest for the NGL or Kingston so they are much lower priorities. The MNL as a whole has significant interest because of the quakes but not enough to bother detailing the historical aspects of much more of it than the branch lines. 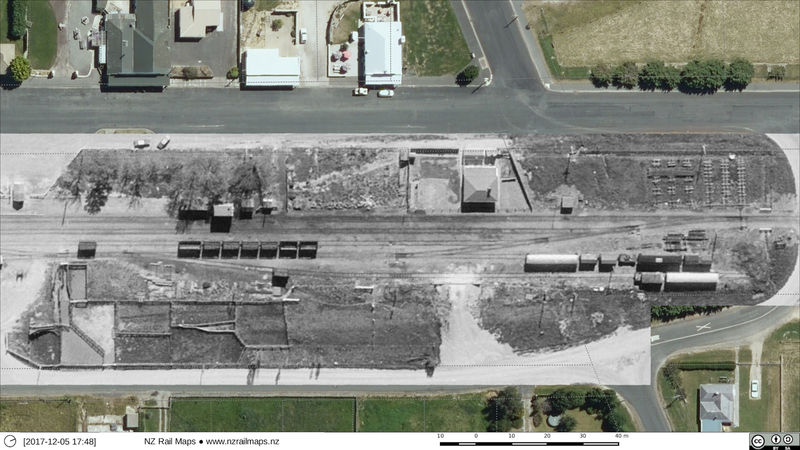 Of course the Otago Central railway has the biggest community of interest and that has largely driven the intensive development of the maps for the area. Getting the aerial photography for even the current basemap is a big step in itself - four separate downloads for NGL for Hawkes Bay because of the download size limit of 3.5 GB - and then picking out just the imagery you need and deleting the rest because it gobbles up disk space - I'm down to 50 GB of free space on a 2 TB disk volume pretty quickly. So a lot of work just for that. If I do Linz basemap coverage for every area that is a lot of work and I expect that I will. Have to start deleting some of those virtual machines I have been testing Qgis on. Now that I have a second computer at my desktop running Qgis as well I can work on two projects at once without using up the RAM on the mainpc running a VM. The second computer only has 8 GB of RAM but that will have to do as another 8 GB would cost $150 and that is just too expensive. My last post looked at what could be done in terms of mapping more detail (i.e. drawing station layouts etc) which has largely been done by photoshopping the historical aerial images over the top of present day ones, which makes it very easy to draw the track layouts on them. Most recently this was done with the Cromwell Gorge, which as the progress reports show, took a week's hard work to complete. 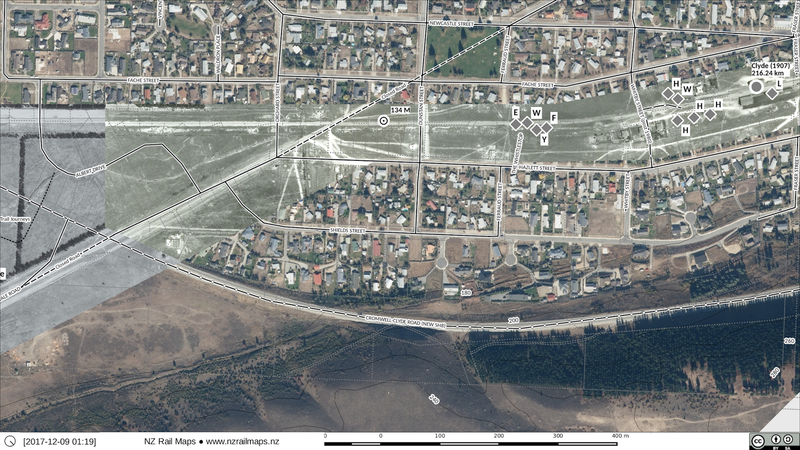 The result has been much better than the earlier efforts which just showed where the railway line went relative to the lake shore and didn't show any of the historical detail that disappeared below the waters. My next achievements will be similar but much less ambitious. The first of these is to map the old WMR line between Johnsonville and Tawa. This is one that really has disappeared off the face of the earth over the last 80 years, being almost completely built over as of now. So it is somewhat comparable to the Cromwell Gorge. Unfortunately I can't get coverage of when it was open, the earliest available is four years after it closed. After that, I am not sure what else there is in NZ that can be comparable. 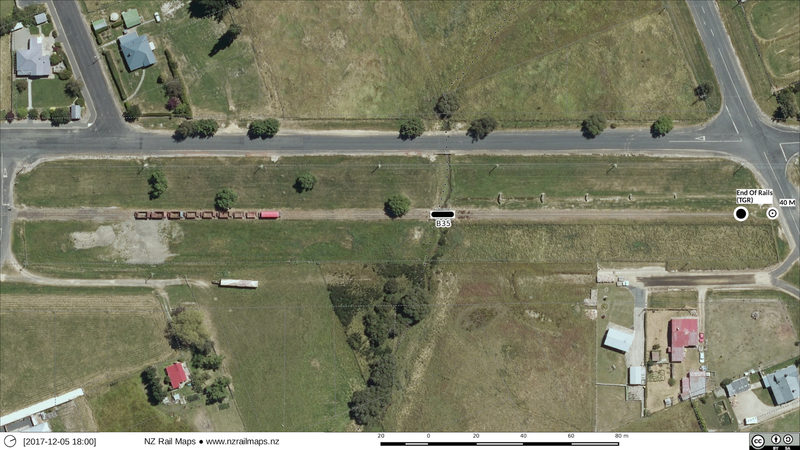 I suppose stuff like the old railway over the Rimutakas or the original railway to Tauranga could be similar, but they would certainly be less interesting. 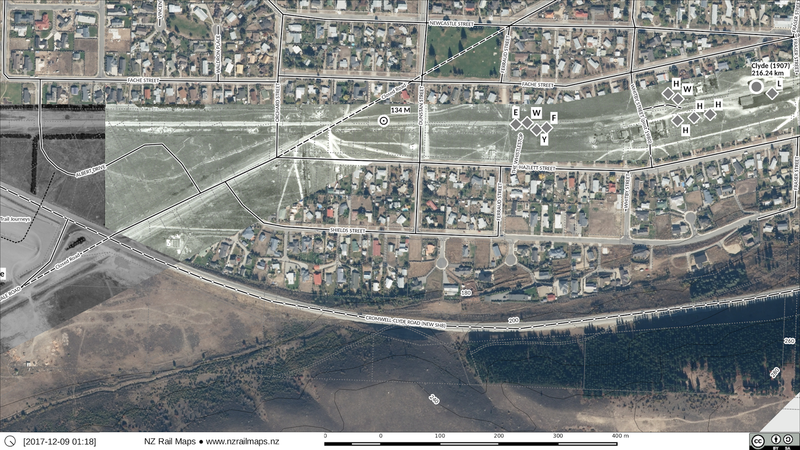 There isn't actually that much aerial coverage of the old Rimutakas at this stage. Getting all the stations on the Napier Gisborne Railway turned out to be interesting because there is aerial coverage of virtually every one. But whether I will map them up, remains to be seen. I don't have much interest in working with any other branch lines except for the Waiau Branch previously mentioned - there is reasonable coverage of most of the stations along it, but I don't have much interest in mapping these at this stage. Information from a file held in Archives New Zealand's Wellington office was forwarded to me today. This is just 2 pages referring to the need for a deviation at 102 miles and the approval from the General Manager of Railways for the deviation to be carried out. The date of the approval is 1909, five years after opening the line. The alteration does not appear to be marked on the chainage charts I have. Since I have finished Part 2 of my series of articles upon the Otago Central Railway, I now have breathing space to have a break over the holidays. Although stuff will still be happening I won't be blogging too much for the rest of this year. Nevertheless before too long the Part 3 deadline will be with us. To fully inform Part 3 requires extra information which I hope will come in within that time - more aerial photos that currently aren't available of some stations such as Ranfurly, Waipiata and those within the Taieri Gorge - and other info including a file on the Auripo realignment that I have ordered a copy of from Archives New Zealand. Somewhere between now and Part 3 being published I have to finish all the maps of the entire line to a reasonable standard. This in turn will let me go ahead with putting together the first part of a map book for Volume 12. The rest of the map book is mainly about the Kingston Branch and its branches, so I will need to do the work on finalising the maps of this section of line as well. However as far as the Kingston Branch goes, there is not likely to be much revision and all that will happen is it will be reviewed by comparing the maps to the current Linz aerial photography of the region. After that it will be time to have a look at what is needed to finish maps for the rest of the country. In the past I have put out several other map books and published online maps for various areas. I will have to look at what is needed to get the maps out for these areas as probably new map books will be preferred. Having removed all the maps previously that were on Flickr, I need to put the maps onto Google but I guess they may well be republished and updated first. 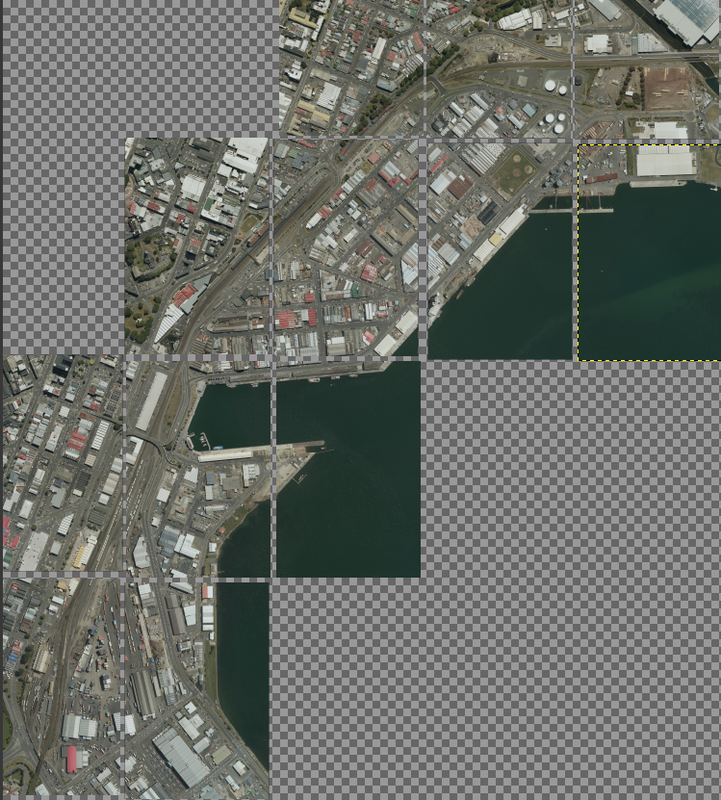 However I need to make it clear that the maps for the rest of the country will not be completed to the same standard as Otago Central even if I do use Retrolens aerials. There simply isn't the time for me to put the same resources into the other maps as I have put into Central Otago, and that was always the intention from day 1. Most of the other maps have already been developed and really it is just a time for finalising and publishing them. Part 2 of the OCR series of 3 articles has reached deadline. The magazine will be out in about 2 months, so watch this space. 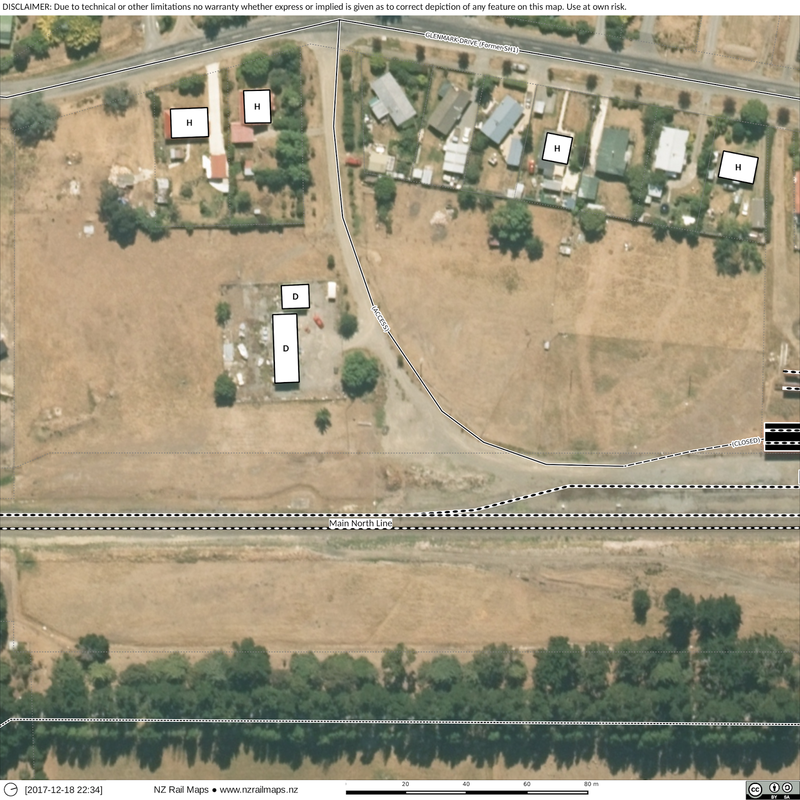 It covers the line mainly from Alexandra to Ranfurly. So here finally are the aerials for Clyde completed. The new Clyde area is for two eras, 1977 and 1981, and the old Clyde area is for 1962. The maps will be updated when I have time as it is somewhat doubtful in this festive season that I will be able to do any more major map work before the new year. Getting the new aerial photos for Clyde together has been slow because of other priorities at a busy time of year. Getting the maps updated may not happen now until early next year, hence another article about Clyde instead of the completion of the maps. In fact I am probably not going to get any more work done this year other than finalising Part 2 of the article for publication. 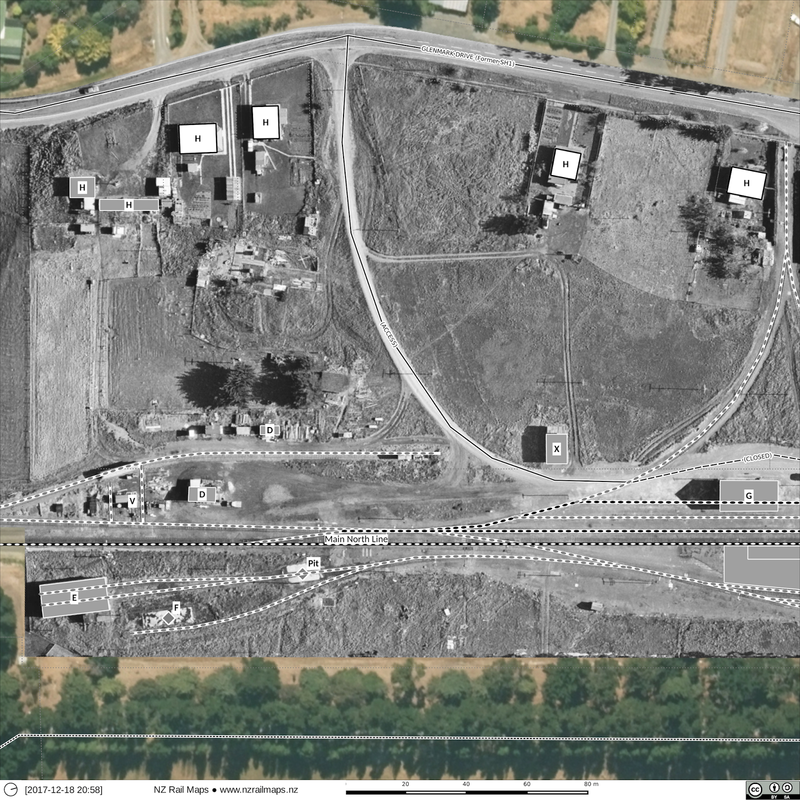 One thing that is missing is pre-1968 coverage of the north side of Clyde where the depot sites were that would show what the NZED site originally looked like. 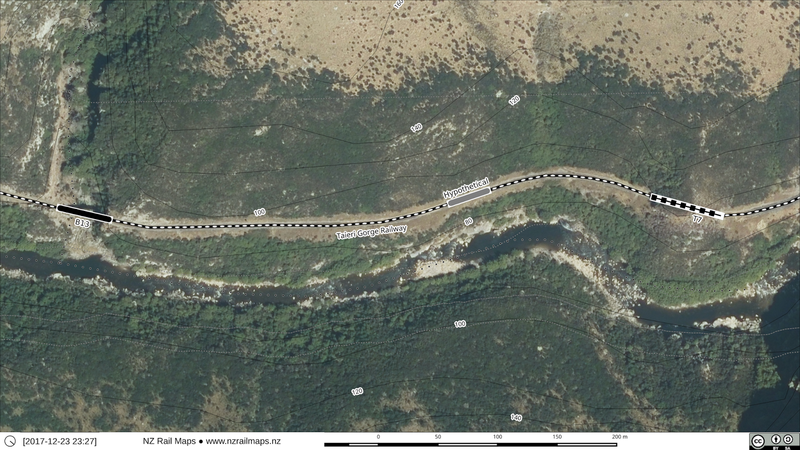 Survey 1452 which I have used for the Alexandra-Cromwell historic maps since it dates from 1962, appears to be either a part survey of SH8 (Roxburgh-Twizel) or a hydro survey, and has only a single line of images all the way along. Survey 1843 of 1966 may have an image that is suitable when Retrolens scans it. So this means the earliest I can have at present for these areas is when the NZED depot was already in place but before the MOW depot was built and the rail line altered at Clyde. 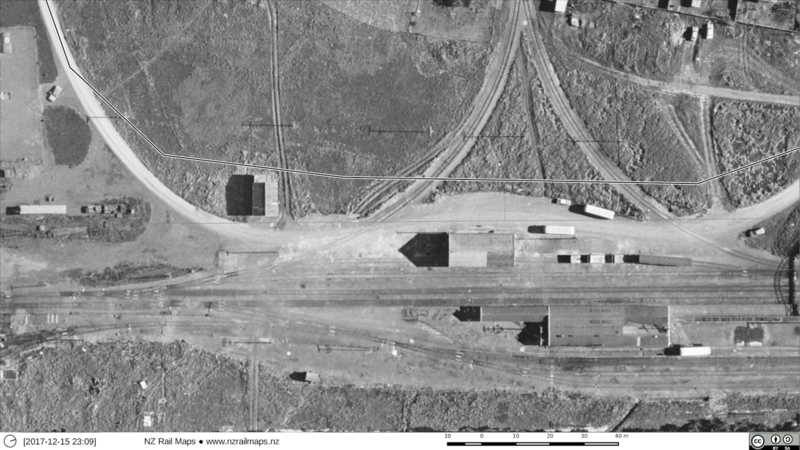 The aerial photos of the new Clyde yard are also shown. What you can see here is basically raw screenshots from Gimp. 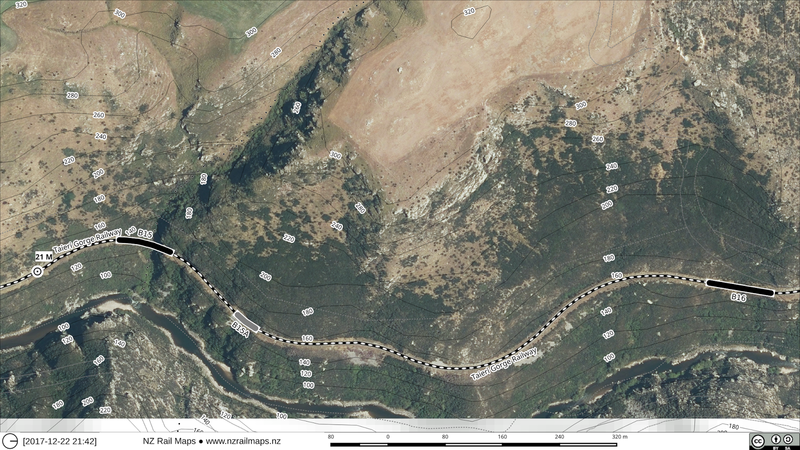 There is still quite a bit of work to do before I can have geojpegs for Qgis. This one uses a 1970s historical view of Clyde with just the NZED depot in place. 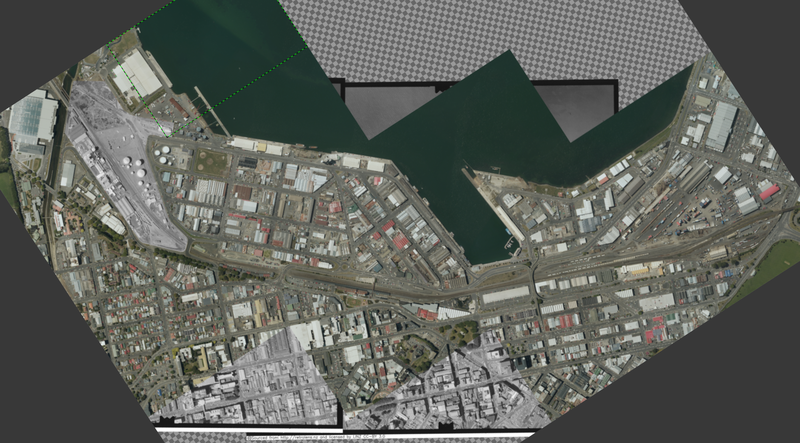 This one uses the 1981 NZR aerial survey of Clyde. 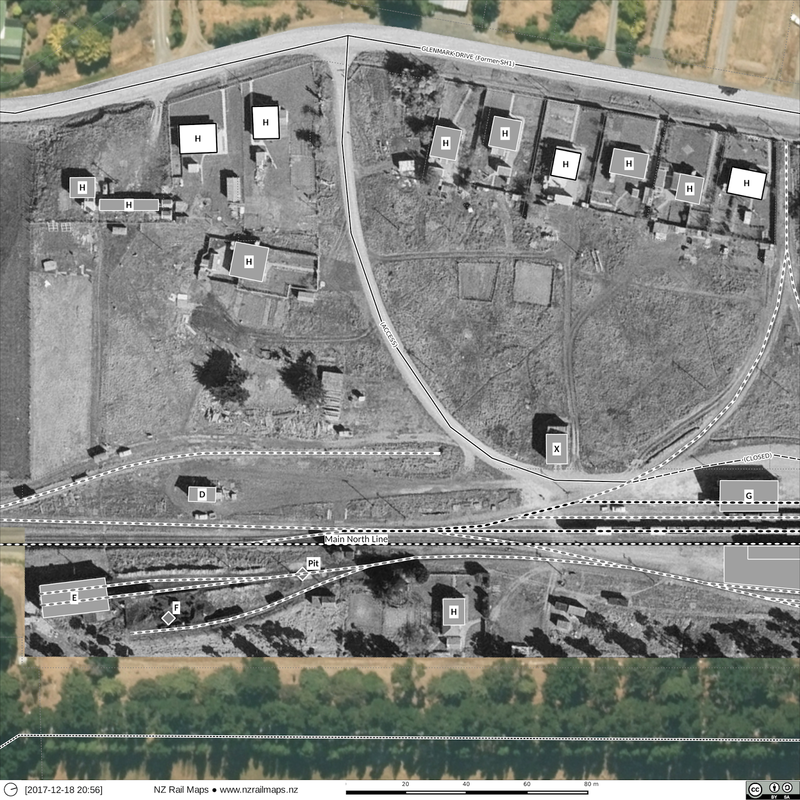 This aerial was at quite a large scale and so on the image you can actually count the railway sleepers. But there are some gaps that will have to be filled in with another aerial from the era. 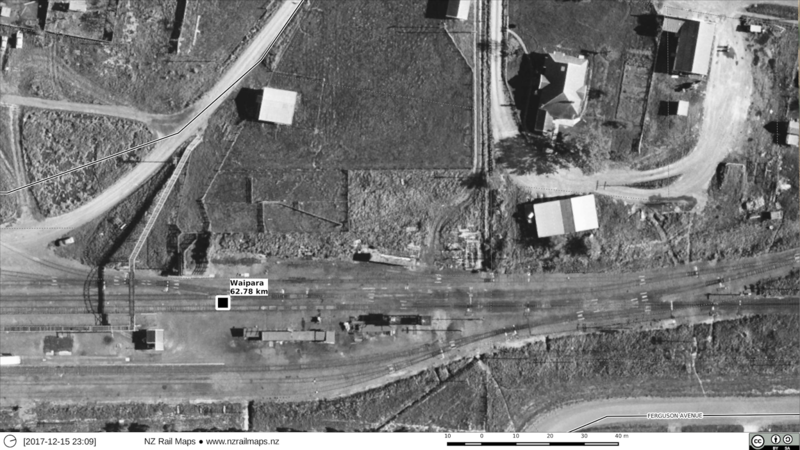 Here we are using 1962 aerials from Survey 1452 to show the old Clyde yard.